Public organisations often face knowledge management problems caused by organisational mobility, the continual and pervasive movement of staff between units and departments. This can be a strength, but also introduces problems of loss of experience and reduced efficiency and effectiveness in working. The Pellucid project is developing a knowledge management system to assist in such situations. The project’s three pilot applications are described, and an abstracted view of their knowledge management needs is developed. An outline of key parts of the technical solution is given. 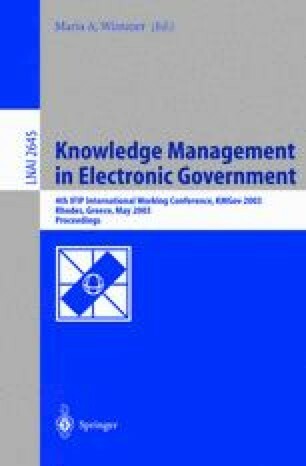 Strassman, P.A., ‘The value of computers, information and knowledg’, 1996, available from website http://www.strassmann.com/pubs/cik/cik-value.shtml.